The great day finally arrived. Expectations were huge and the adrenalin was flowing. From 9.30 a.m. waves of Trinity Brethren began to descend on Stirling Road, firstly with the equipment from Coventry to be set up in the Temple and then with the menu cards and the blue boxes containing the firing glass gifts for attendees to be set out next to the splendid blue and gold floral arrangements and the candlesticks with blue candles on the dining tables for the festive board. The main Temple looked resplendent with the four blue Coventry pedestals and the magnificent Trinity Chair in centre stage. Our Banner was also prominent on its stand raised above a wooden pedestal to the rear left of the Chair. The Worshipful Master, W.Bro David Joyce, arrived, small in stature but with his beaming red face exuding outward confidence. The acting Grand Director of Ceremonies, V.W.Bro Tom Caplin P.G.SwdB, came early to supervise, and he 'had his little list'; whilst the Provincial Grand Secretary, W.Bro Nigel Bister, was running around frantically to ensure that everything within his control was in order. In fact the only small problem encountered was the lack of a key for our own working tools box; but Bro Joyce dashed to a local locksmith and rescued the situation. The Installation Meeting commenced at 4.00 p.m. with 234 Brethren present. The W.M. received and welcomed deputations from Lodge 'Trinity' Trinity No 885 (S.C.) Edinburgh, Lodge Burns Immortal No 1730 (S.C.) Hamilton and the Atholl Lodges, the latter being represented by their Association Secretary W.Bro Paul Gardner and their Archivist W.Bro Ray Sheppard. Also present was W.Bro Don MacLean of Mount Calvary Preceptory 'D', a conclave of Knights Templars originally founded before 1785 within Antients Lodge No 43, which later as a Moderns Lodge became known as Trinity Lodge. The W.M. then instructed all present to remove their gloves, referred to the taking of official photographs immediately after the ceremony, and requested all taxpaying Brethren to use the gift aid envelopes. V.W.Bro Richard V.Wallis P.Dep Prov. G.M. (Warwickshire) (M.E.Grand Superintendent) R.W.Bro Robert Scott Tait P.Prov.G.M. (Edinburgh) S.C. The Lodge was further honoured in the Temple by the presence of three of our own Assistant Provincial Grand Masters – W.Bro David Rawlins P.S.G.D. (Dep Prov.G.M. designate), W.Bro David W. Old P.S.G.D. and W.Bro Rodney Pitham P.S,G.D.. V.W.Bro. Richard Wallis P.G.SwdB., a Past Deputy P.G.M. for Warwickshire and the current M.E.Grand Superintendent, was also in attendance. The A.G.M. was offered the gavel which he refused and the Worshipful Master, W.Bro David Joyce, proceeded with the ceremony and installed the R.W.Bro Michael J.Price C.B.E., the Provincial Grand Master, into the chair of Trinity Lodge in a superb and exemplary fashion and in accordance with the extended workings of the Board of Installed Masters, and with the assistance of other Past Masters of the Lodge who took part. 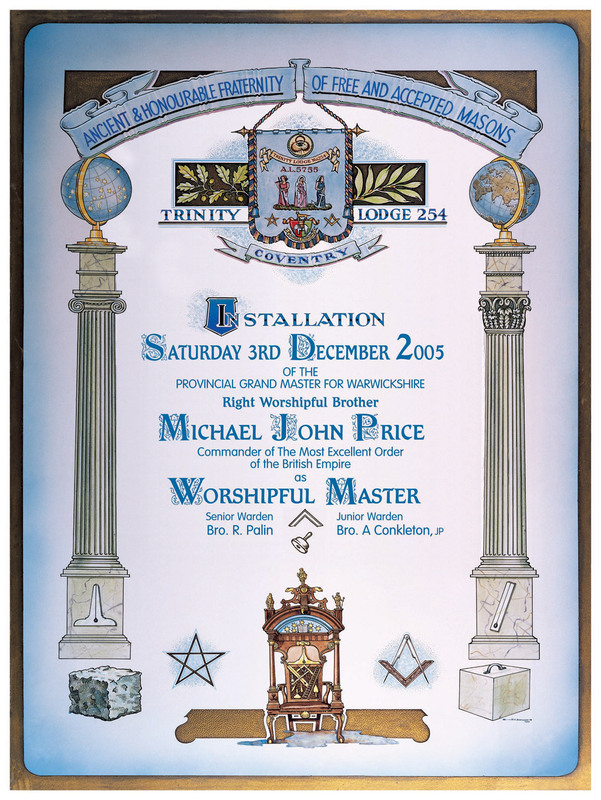 The Worshipful Master then appointed and invested his officers. 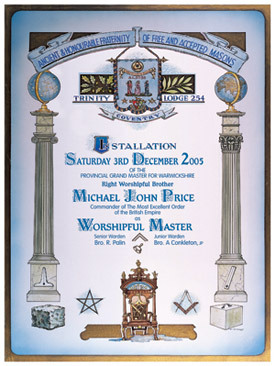 Worshipful Master - Michael J.Price C.B.E. The A.G.M.gave the Address to the Master in a wonderfully relaxed manner and the proceedings progressed in usual form (but with a charity collection in the Lodge) until after the Risings when the W.M. presented the P.G.M. with a beautifully crafted decanter in a wooden holder, the latter having been specially designed and made by the Immediate Past Master, W.Bro David Joyce. W.Bro Stuart Leist P.Prov. S.G.W. W.Bro Peter Amery P.Prov S.G.W. W.Bro Walter Hope P.Prov S.G.W. Another surprise was when the delegation from Lodge 'Trinity' Trinity presented the Lodge with a beautiful silver quaich drinking cup, suitably inscribed; and the A.G..M. with a bottle of best Scotch Whisky. The Lodge was then closed at 7.15 p.m. and the A.G.M. and the W.M. processed out together under the direction of V.W.Bro Caplin.